Could you eat ALL of a pig? Yes, I know this isn’t a pig. It’s Kica, my dog. But she is the cause of my question. Let me explain. Kica is difficult to feed. She’s ultra fussy but I think she deserves a bit of spoiling after her awful life cowering in a horrible dog pound in Serbia. She had distemper and gum infections that weren’t treated so has lost most of her teeth. She still has a fistula between her nasal and oral cavities which cause her to snort and sneeze from time to time but after three operations since being rescued they still haven’t closed. She has learned to live with it. It’s been impossible to find a dogfood that she likes and the amount of tinned food I’ve thrown away doesn’t bear thinking about. Jay and CC brought back some different makes the last time they went to England and she took a fancy to Butcher’s dog food but we can’t get that here. So I asked Jay to look for cheap cuts of meat that I could cook for her and mix with dog biscuits softened in the cooking juice. Bingo! She loved it. Now pork is the most common (and least expensive) meat in our area but I was surprised when he brought back pig’s tongue, throat and tail all found on the ordinary meat counter. Only once has he found some beef marked for animals. Do people really eat these parts of a pig? I’ve eaten lanque de boeuf so I suppose langue de porc isn’t so far removed and, sure enough, there were plenty of recipes to be found on Google France. .I’ve also eaten gesiers (birds’ gizzards) but eating pig’s throat doesn’t sound very tasty. However, there were also recipes for this online. But pig’s tail! How would you eat that?? The package said it would need 45 minutes in a pressure cooker or three and a half hours in a saucepan. Kica’s supper is on the stove now but there are recipes for pig’s tail wiith chick peas or lentils and various herbs if ever I should dare serve it up to the family. . . . . . . . .
As mentioned in the previous post the visitors I was looking forward to seeing couldn’t come this weekend. Unfortunately I had asked one of the local hunters if he would sell me something from his freezer and it was too late to cancel the request. Nevermind, I thought I could keep it in my freezer but he had thawed it and there was a vast quantitiy: two legs and two shoulders. It was a mixture of venison and boar but once I got it home I didn’t know which was which. Yesterday I cooked the two leg joints and I would guess that we had the boar last night and the venison, reheated in the gravy, for lunch today. I cooked the two shoulders slowly in the oven this morning after marinating them in red wine overnight. Not sure what I’ll do with them tomorrow. Considering Bear and Whale’s tastes it coud be a version of Cottage Pie! As I had time on my hands I decided to pick some plums and mirabelles to make jam. This is the first year that the mirabelle tree has produced a good quantity of fruit. Last yearI I counted all of six but this year the branches are heaving. Lots have already fallen and the chickens have been pecking at them and some are beginning to rot. The traditional method of harvesting them – put a sheet on the ground and shake the tree – doesn’t seem very practical in a chicken run where they could walk all over the fruit and even poo on it. Even picking by hand has it’s hazards as Molly thinks she’s a parrot and often climbs onto my shoulder. She was sitting there during the plum picking and then I smelled an awful smell and found she had poohed down my back. There are two plum trees .but i don’t recognise the varieties. One produces cherry sized plums which are meant for jam or ‘gouttes’ (home-made fruit spirit) and the other produces two kinds:- elongated purple plums which remain rock hard and small, round red ones, again for jam and gouttes. I picked about 6 kilos and after hours of stoning and stirring there are only ten pots of jam to show for it. Today’s post is rather ‘bitty’ so here goes with a mishmash of news. Pascal and Florence have just been round to thank me for feeding Timon (actually spelled Thymon), take back their key and leave presents – a bottle of Reisling and 6 hock glasses. They also brought a chilled bottle of Crement d’Alsace to share there and then so we had a pleasant chat over a glass of fizz. It seems that Thymon had sulked at first but soon appreciated his cuddles again. It’s intriguing that when I look at my stats I find that the most popular post has been Suppository for a Sore throat – goodness knows why, but it crops up day after day. Second in popularity is French funeral. Nothing else seems to attract attention. This morning I asked Vero, Julie’s partner who had taken over her round, how it had happened. At present they don’t know the prognosis but Vero, who always seems to look on the black side, announced that he could spend the rest of his life in a wheelchair. He may have been an idiot but I hope she’s wrong! My first ever boyfriend, whom I found again via Friends Reunited a few years ago was planning to come and visit us next weekend.. He has been before, once on his own and once with his girlfriend (he’s widowed) but he phoned yesterday to say he had had to go to Casualty because he couldn’t pee. He had a biopsy last Thursday and they warned him the prostate might swell but he didn’t expect the agony of not being able to pass water. He is now fitted with a catheter until the hospital call him in to check whether or not he can manage without it so if he’s not back to normal by Friday he will be staying at home. Oh dear. Beattie is broody again. 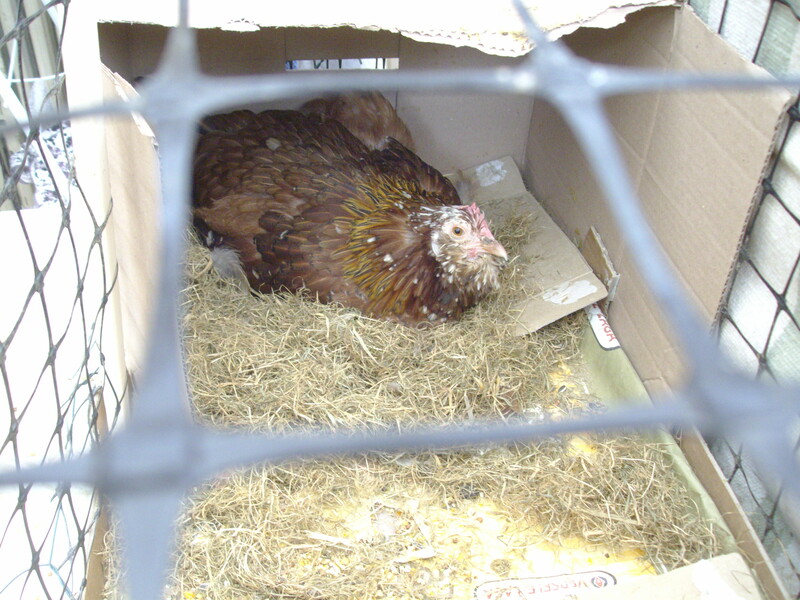 Her last chicks are now four months old and living happily with the flock but they sleep in their own coop. I really don’t need any more babies but Beattie just has two eggs left (having broken the rest!) so I’ll leave her for another week or so to see if they hatch. Also in the conservatory we have Briony and her chicks. Biscuit was born with her legs splayed so that she couldn’t walk but she’s fine now and has developed into a pretty chicken with colourings like her mum. 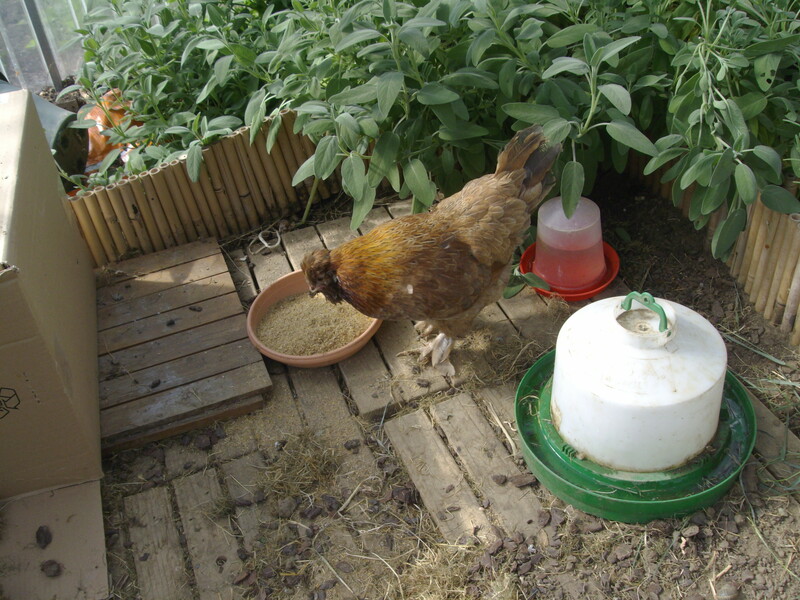 Behind her is Froh who seems more Maran like his dad, Hector. 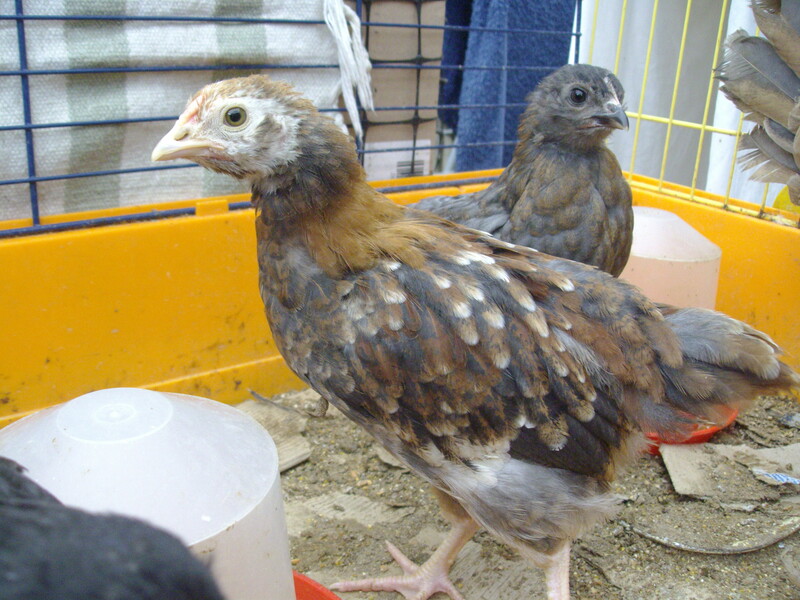 Fricka and Freya also seem to have more Maran genes so I hope they are all girls as Marans lay nice brown eggs. Not to be outdone in the nest department, Willow has taken to making herself comfortable on the duvet from Whale’s bed. He has found it too hot recently so it has been left in the library. Willow will be most upset when he wants it back. 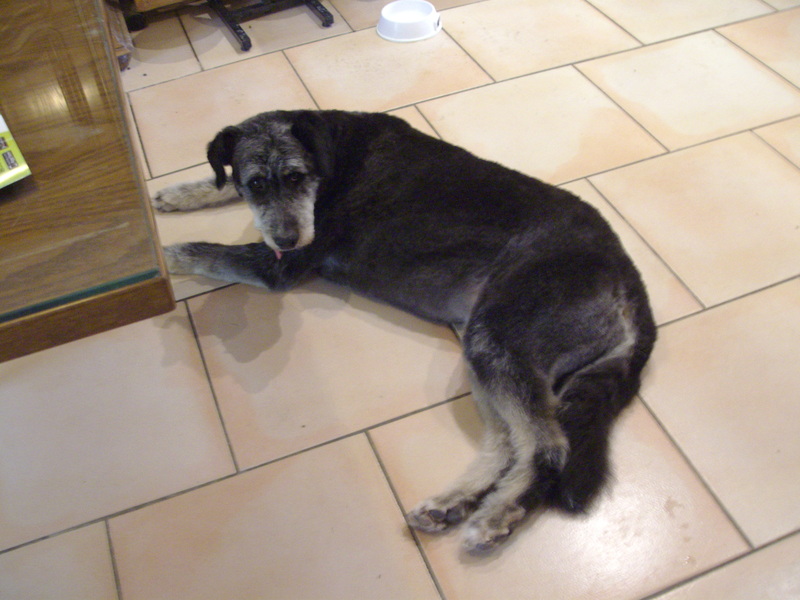 Last but not least in animal news, Kica went for her haircut on Thursday and so now looks really beautiful and smells a lot fresher as well. The chap sprays her with doggy perfume when he has finished! He said her fur was thicker than ever this time so she will certainly notice the difference and, yes, she is a bit livlier now. Friends in the next road, Florence and Pascal have asked me to feed their cat while they’re away next week so I went to meet Timon and get instructions and the key on Friday evening. 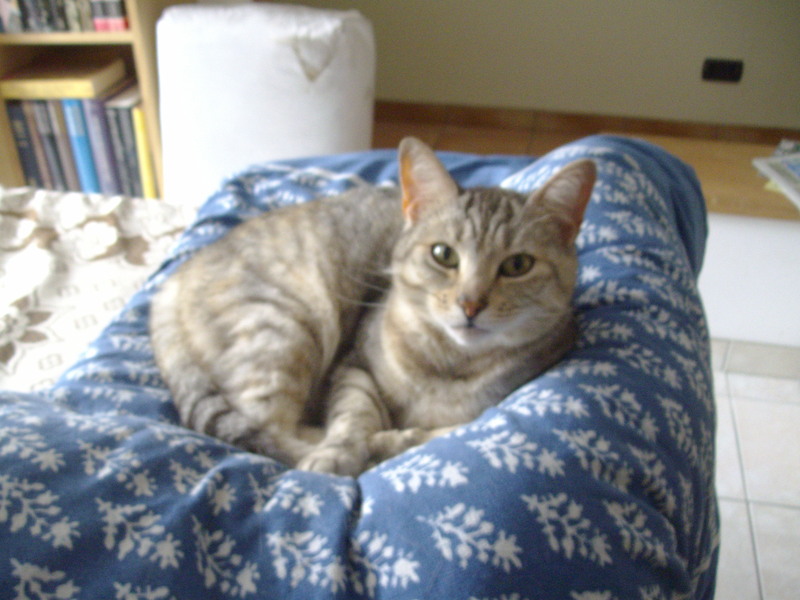 He is a gorgeous tabby cat, very affectionate and cuddly but when Florence handed me the instructions I was amazed. He has TWO or THREE sachets of Felix in the morning, plus biscuits: one or two sachets at 5 0’clock and one or two again at 9p.m. My FIVE cats eat six to eight sachets a day between them – but (like Timon) they do have catbiscuits available all day long. You would think Timon was fat but he’s no bigger than my cats so I asked Florence and Pascal if he invited all the neighbourhood cats in for a party while they’re at work! CC and I tried out a new place for lunch a couple of months ago and had mixed feelings. I had seen a flyer in the Mairie for Le Chat a deux Tetes in a neighbouring village and was intrigued. They advertised gites, chanbres d’hote, bar and restaurant and an art gallery. We looked round the gallery (cost 1 euro each) but it wasn’t my cup of tea. A rather poor imitation of Picasso’s style with lots of purple or bright green bottoms – yuk! Lunch was rather better but the vegetables (fresh garden produce) were luke warm and dessert was a strange cooked (but cold) fruit salad served in a plastic beaker. I also managed to find four whole star anises in mine! The poor lady, who did everything herself – cooking, serving and clearing away – was rather stressed because a table of workmen objected to Timothy the cat being around. Well, we were eating outside and cats tend to wander in the garden. The owner tried to persuade him to stay indoors but as she had to go in and out it was a losing battle. We thought it was well worth a second visit though and invited Yvette and Lulu for a girls’ outing this week. We ate outside and were the only ones there. The owner was much more relaxed and was laughing and joking with us this time. However, she did have to tell us the sad news that Timothy had died since our last visit. 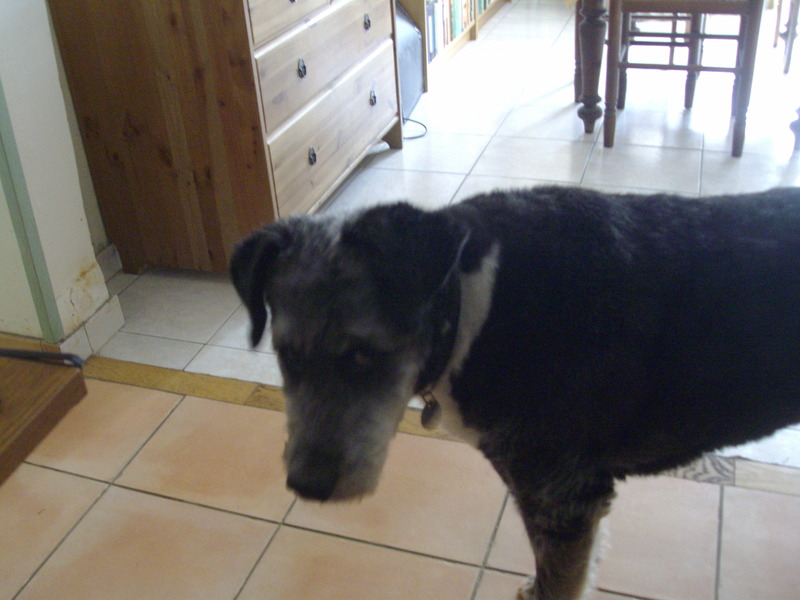 He was 15 years old and they had found a tumour. On a more optimistic note, Lulu (yes, one of the other cats is called Lulu) is pregnant and she is hoping the father is the rather handsome tabby and white cat who pops in from time to time. The food was excellent; oeuf en gelée, roast pork with peas, carrots and potatoes and an interesting pear and chocolate dessert served with blueberry jam, cherry coulis and icecream flavoured with rosewater. We shared a bottle of rosé wine which was very reasonably priced. Afterwards we all had coffee except Lulu, who asked for tea. She was presented with a dish of different flavoured teas packed in little pyramids. They even had Lapsang Souchong and Rooibos which she had never heard of. I recommended the latter, as Chinese tea is a bit of an acquired taste, and she really enjoyed it. It came in an interesting flat Japanese teapot and there was enough for the rest of us to try some after rinsing out our coffee cups. We passed a pleasant couple of hours or so with Lulu doing most of the talking. Yvette admitted afterwards that she tends to be shy with people she has only just met so I’m not sure whether to invite them together again or not. Anyway, we’ll definitely be going back to the Chat a deux Tetes.